A new year is here and this is a great time to start new things! If you wanted to start art journaling but have been putting it off or making excuses...this is the time to start. If you are an art journal veteran then a new year is perfect for starting a new journal. 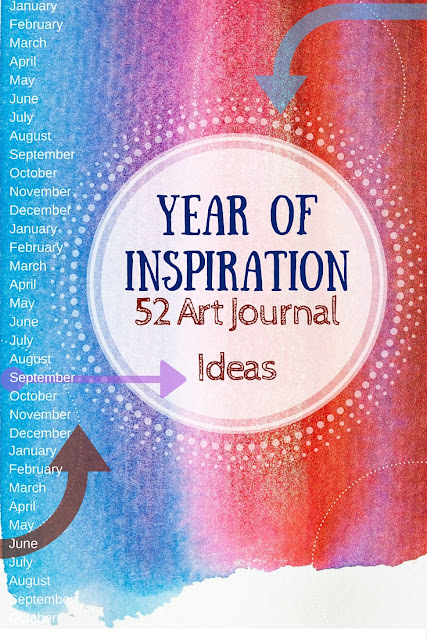 No matter where you are in regards to your art journaling here are 52 ideas to fill your entire year with inspiration! These ideas are meant to jumpstart your creativity, give you an idea on what to create a page about. You can use any material, medium or technique you like or take a chance and experiment with new thing. 1. It's all about me: things you like, or don't like. 2. Small things that make you happy. 3.What are you thankful for. 4. Your favorite quote right now. 5. What are you scared of. 6. Someone who inspires you. 7. The place you live in. 8. Your favorite childhood memory. 9. The best thing that happened to you this week. 10. Something you want to change about yourself. 13. One thing you want to learn. 14. Something you could do right now to get you closer to where you want to be in life. 18. A word that actually describes your life or a word you wish described your life. 19. What you like the most about your art. 20. A challenge you've overcome. 21. What do you love about yourself. 22. Your favorite bible verse. 23. The last time you broke the rules. 24. Something to let go of. 25. What was the last new thing you tried. 26. The worst idea you've had. 28. The one dream you have that you just can't stop thinking about. 29. Write a letter to your younger self. 30. What do you say only to yourself. 31. What cheers you up. 32. The happiest moment in your week so far. 34. The last bad day you had. 35. What is holding you back. 37. What are you most proud of. 38. One thing you want to improve in yourself. 39. The best decision you ever made. 41. A list of your favorite books and why you love them. 43. Something you're really good at. 44. The hardest thing you ever did. 45. What do you miss the most. 46. Something you're stressed about. 48. Words you can't say. 49. What I'm angry about. 52. My goal for this/next year. Please share your art journal ideas in the comments. I'm sure there so many I haven't thought about.